A British AgustaWestland Apache helicopter fires rockets at insurgents in Afghanistan, 2008. An attack helicopter is an armed helicopter with the primary role of an attack aircraft, with the capability of engaging targets on the ground, such as enemy infantry and armored fighting vehicles. Due to their heavy armament they are sometimes called helicopter gunships. Weapons used on attack helicopters can include autocannons, machine guns, rockets, and guided anti-tank missiles such as the Hellfire. Many attack helicopters are also capable of carrying air-to-air missiles, though mostly for purposes of self-defense. Today's attack helicopter has two main roles: first, to provide direct and accurate close air support for ground troops, and second, the anti-tank role to destroy enemy armor concentrations. Attack helicopters are also used to supplement lighter helicopters in the armed scout role. 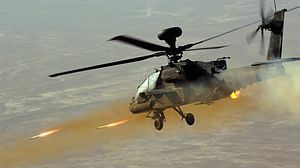 In combat, an attack helicopter is projected to destroy around 17 times its own production cost before it is destroyed. Low-speed, fixed wing Allied aircraft like the Soviet Polikarpov Po-2 training and utility biplane had been used as early as 1942 to provide night harassment attack capability against the Wehrmacht Heer on the Eastern Front, most effectively in the Battle of the Caucasus as exemplified by the Night Witches all-female Soviet air unit. Following Operation Overlord in 1944, the military version of the similarly slow-flying Piper J-3 Cub high-wing civilian monoplane, the L-4 Grasshopper, begun to be used in a light anti-armor role by a few U.S. Army artillery spotter units over France; these aircraft were field-outfitted with either two or four bazooka rocket launchers attached to the lift struts, against German armored fighting vehicles. During the summer of 1944, U.S. Army Major Charles Carpenter managed to successfully take on an anti-armor role with his rocket-armed Piper L-4. His L-4, bearing US Army serial number 43-30426 and named Rosie the Rocketer, armed with six bazookas, had a notable anti-armor success during an engagement during the Battle of Arracourt on September 20, 1944, employing top attack tactics in knocking out at least four German armored vehicles, as a pioneering example of taking on heavy enemy armor from a slow-flying aircraft. The Germans themselves were also engaged in such ad-hoc, low-speed "light aircraft" platforms for ground attack very late in the war, with one subtype of the Bücker Bestmann trainer—the Bü 181C-3—armed with four Panzerfaust 100 anti-tank grenade launchers, two under each of the low-winged monoplane's wing panels, for the concluding two months of the war in Europe. This sort of role, being undertaken by low-speed fixed-wing light aircraft was something that was also likely to be achievable after World War II, from the increasing numbers of post-war military helicopter designs. The only American helicopter in use during the war years, the Sikorsky R-4, was only being used for rescue and were still very much experimental in nature. In the early 1950s, various countries around the world started to make increased use of helicopters in their operations in transport and liaison roles. Later on it was realised that these helicopters, successors to the World War II-era Sikorsky R-4, could be armed with weapons in order to provide them with limited combat capability. Early examples include armed Sikorsky H-34s in service with the US Air Force and armed Mil Mi-4 in service with the Soviet Air Forces. In the opening months of the Korean War era, in August 1950 a joint US Navy and Marine Corps test used a newly acquired Bell HTL-4 helicopter to test if a bazooka could be fired from a helicopter in flight. One of the larger 3.5 inch (90mm calibre) models of the bazooka was chosen, and was mounted ahead and to the right of the helicopter to allow the door to remain clear. The bazooka was successfully tested, although it was discovered that it would require shielding for the engine compartment, which was exposed in the model 47 and other early helicopters. The helicopter itself belonged to HMX-1, a Marine experimental helicopter squadron. This "experimental" trend towards the development of dedicated attack helicopters continued into the 1960s with the deployment of armed Bell UH-1s and Mil Mi-8s during the Vietnam War, to this day the pair of most produced helicopter designs in aviation history. These helicopters proved to be moderately successful in these configurations, but due to a lack of armor protection and speed, they were ultimately ineffective platforms for mounting weapons in higher-threat ground combat environments. Since the 1960s, various countries around the world started to design and develop various types of helicopters with the purpose of providing a heavily armed and protected aerial vehicle that can perform a variety of combat roles, from reconnaissance to aerial assault missions. By the 1990s, the missile-armed attack helicopter evolved into a primary anti-tank weapon. Able to quickly move about the battlefield and launch fleeting "pop-up attacks", helicopters presented a major threat even with the presence of organic air defenses. The helicopter gunship became a major tool against tank warfare, and most attack helicopters became more and more optimized for the antitank mission. In the mid-1960s, the U.S. Army concluded that a purpose-built attack helicopter with more speed and firepower than current armed helicopters was required in the face of increasingly intense ground fire (often using heavy machine guns and anti-tank rockets) from Viet Cong and NVA troops. Based on this realization, and with the growing involvement in Vietnam, the U.S. Army developed the requirements for a dedicated attack helicopter, the Advanced Aerial Fire Support System (AAFSS). The aircraft design selected for this program in 1965, was Lockheed's AH-56 Cheyenne. As the Army began its acquisition of a dedicated attack helicopter, it sought options to improve performance over the continued use of improvised interim aircraft (such as the UH-1B/C). In late 1965, a panel of high-level officers was selected to evaluate several prototype versions of armed and attack helicopters to determine which provided the most significant increase in capability to the UH-1B. The three highest-ranked aircraft, the Sikorsky S-61, Kaman H-2 "Tomahawk", and the Bell AH-1 Cobra, were selected to compete in flight trials conducted by the Army's Aviation Test Activity. Upon completion of the flight evaluations, the Test Activity recommended Bell's Huey Cobra to be an interim armed helicopter until the Cheyenne was fielded. On 13 April 1966, the U.S. Army awarded Bell Helicopter Company a production contract for 110 AH-1G Cobras. The Cobra had a tandem cockpit seating arrangement (vs UH-1 side-by-side) to make the aircraft a smaller frontal target, increased armor protection, and greater speed. In 1967, the first AH-1Gs were deployed to Vietnam, around the same time that the Cheyenne successfully completed its first flight and initial flight evaluations. And while the Cheyenne program suffered setbacks over the next few years due to technical problems, the Cobra was establishing itself as an effective aerial weapons platform, despite its performance shortcomings compared to the AH-56 and design issues of its own. 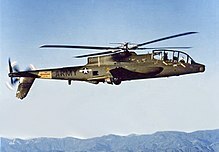 By 1972, when the Cheyenne program was eventually cancelled to make way for the Advanced Attack Helicopter (AAH), the interim AH-1 "Snake" had built a solid reputation as an attack helicopter. In June 1972 the USMC began deploying AH-1J SeaCobra Attack Helicopters for combat operations in South Vietnam. During the late 1970s, the U.S. Army saw the need of more sophistication within the attack helicopter corps, allowing them to operate in all weather conditions. With that the Advanced Attack Helicopter program was started. From this program the Hughes YAH-64 came out as the winner. The prototype YAH-64 was first flown on 30 September 1975. The U.S. Army selected the YAH-64 over the Bell YAH-63 in 1976, and later approved full production in 1982. After purchasing Hughes Helicopters in 1984, McDonnell Douglas continued AH-64 production and development. The helicopter was introduced to U.S. Army service in April 1986. Today, the US attack helicopter has been further refined, and the AH-64D Apache Longbow demonstrates many of the advanced technologies being considered for deployment on future gunships. The US Marine Corps also continued to employ attack helicopters in the direct fire support role, in the form of the AH-1 Super Cobra. While helicopters were effective tank-killers in the Middle East, attack helicopters are being seen more in a multipurpose role. Tactics, such as tank plinking, showed that fixed-wing aircraft could be effective against tanks, but helicopters retained a unique low-altitude, low-speed capability for close air support. Other purpose-built helicopters were developed for special operations missions, including the MH-6 for extremely close support. Mil Mi-24P, a later production variant of the Mi-24. These helicopters were used extensively in the Soviet–Afghan War. During the early 1960s, Soviet engineers started experimenting with various designs aimed at producing an aerial vehicle that could provide battlefield mobility for infantry and provide fire support to army forces on the ground. The first of these concepts was a mock-up unveiled in 1966 in the experimental shop of the Ministry of Aircraft's factory number 329, where Mikhail Leont'yevich Mil was head designer. The mock-up, which was designated V-24, was based on another project, the V-22 utility helicopter, which itself never entered production. The V-24 had an infantry transport compartment that could hold eight troops sitting back to back, and a set of small wings positioned to the top rear of the passenger cabin, capable of holding up to six missiles or rocket pods, along with a twin-barrel GSh-23L cannon fixed to the landing skid. These designs were proposed by Mil to the Soviet armed forces, and while he had the support of a number of strategists, he was opposed by several more senior members of the armed forces who believed that conventional weapons were a better use of resources. Despite the opposition, Mil managed to persuade the defence minister's first deputy, Marshal Andrey A. Grechko, to convene an expert panel to look into the matter. While the panel's opinions were mixed, supporters of the project eventually held sway and a request for design proposals for a battlefield support helicopter was issued. The development of gunships and attack helicopters by the US Army during the Vietnam War convinced the Soviets of the advantages of armed helicopter ground support doctrine, which had a positive influence on moving forward with the development of the Mil Mi-24. After several mock-ups were produced, a directive was issued on 6 May 1968 to proceed with development of a twin-engine design of the helicopter. Work proceeded under Mil until his death in 1970. Detailed design work began in August 1968 under the codename Yellow 24. A full-scale mock-up of the design was reviewed and approved in February 1969. Flight tests with a prototype began on 15 September 1969 with a tethered hover, and four days later the first free flight was conducted. A second prototype was built, followed by a test batch of ten helicopters. A number of other design changes were made until the production version Mi-24A entered production in 1970, obtaining its initial operating capability in 1971 and was officially accepted into the state arsenal in 1972. Numerous versions have been developed to this day. In 1972, following completion of the Mi-24, development began on a unique attack helicopter with transport capability. The new design had a reduced transport capability (3 troops instead of 8) and was called the Mil Mi-28. Also developed was the Ka-50 attack helicopter, which is smaller and more maneuverable and does not have a cabin for carrying troops. A Russian Mil Mi-28N. The Mil Mi-28 along with the Ka-50 represented the first dedicated attack helicopter of the Soviet Air Forces in the 1980s. In 1977, a preliminary design of the Mil Mi-28 was chosen, in a classic single-rotor layout. Its transport capability was removed and it lost its similarity to the Mi-24. Design work on the Mi-28 began under Marat Tishchenko in 1980. In 1981, a design and a mock-up were accepted. The prototype (no. 012) was first flown on 10 November 1982. In this same time frame, Kamov was also attempting to submit its own designs for a new helicopter to the military, which they had designed throughout the early and mid 1980s. In 1984, the Mi-28 completed the first stage of state trials, but in October 1984 the Soviet Air Force chose the more advanced Kamov Ka-50 as the new anti-tank helicopter [de]. The Mi-28 development was continued, but given lower priority. In December 1987 Mi-28 production in Rosvertol in Rostov-on-Don was approved. After several prototypes were built, production ceased in 1993 with additional development continuing into the 21st century. Changes in the military situation after the Cold War made specialized anti-tank helicopters less useful. The advantages of the Mi-28N, like all-weather action ability, lower cost, and similarity to the Mi-24, have become more important. In 2003, the head of Russian Air Force stated that the Mi-28N and Ka-50 attack helicopters will become the standard Russian attack helicopter. The first serial Mi-28N was delivered to the Army on 5 June 2006. In 1979, the Chinese military studied the problem of countering large armor formations. It concluded that the best conventional solution was to use attack helicopters. Eight Aérospatiale Gazelle armed with Euromissile HOT were procured for evaluation. By the mid-1980s, the Chinese decided a dedicated attack helicopter was required. At the time, they used civilian helicopters converted for the military; these were no longer adequate in the attack role, and suitable only as scouts. Following this, China evaluated the Agusta A129 Mangusta, and in 1988 secured an agreement with the US to purchase AH-1 Cobras and a license to produce BGM-71 TOW missiles; the latter was cancelled following the Tiananmen Square protests of 1989 and the resulting arms embargo. The color revolutions prevented the purchase of attack helicopters from Eastern Europe in 1990 and 1991; Bulgaria and Russia rejected Chinese offers to purchase the Mil Mi-24. 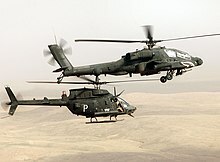 While attempting to import foreign designs failed, war games determined that attack helicopters had to be commanded by the army, rather than the air force. This led to the formation of the People's Liberation Army Ground Force Aircraft (PLAGFAF), with an initial strength of 9 Harbin Z-9s. The PLAGFAF conducted tactical experiments that would help define the future Z-10's requirements. Research also decided that anti-tank missiles like the BGM-71 TOW were inadequate, and favored an analogue to the AGM-114 Hellfire. The Gulf War highlighted the urgent need for attack helicopters, and revalidated the assessment that a purpose-built design was needed. (At the time, the Chinese military depended on armed utility helicopters such as the Changhe Z-11 and Harbin Z-9.) Also, it demonstrated that the new attack helicopter would need to be able to defend itself against other helicopters and aircraft. 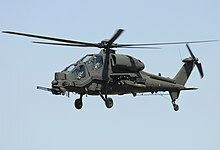 The military perceived that once the new attack helicopter entered service, the existing helicopters would be used as scouts. The Armed Helicopter Developmental Work Team (武装直升机开发工作小组) was formed to develop a new medium helicopter design, as opposed to basing the new design on the light helicopters then in service. The 602nd and 608th Research Institutes started development of the 6-ton class China Medium Helicopter (CHM) program in 1994. The program was promoted as a civilian project, and was able to secure significant Western technical assistance, such as from Eurocopter (rotor installation design consultancy), Pratt & Whitney Canada (PT6C turboshaft engine) and Agusta Westland (transmission). The Chinese concentrated on areas where it could not obtain foreign help. The 602nd Research Institute's called its proposed armed helicopter design the WZ-10 (武直; Wǔ Zhí; 'armed helicopter'-10). The 602nd Research Institute was assigned as the chief designer, while Harbin Aircraft Manufacturing Corporation (HAMC) of China Aviation Industry Corporation II (AVIC II) was assigned as the primary manufacturer. Nearly four dozen other establishments participated in the program. According to Chinese sources, the initial test flights were concluded on December 17, 2003, whereas according to other sources they were completed nine months earlier in March 2003. According to Jane's Information Group, a total of 3 prototypes had completed over 400 hours of test flights by this time. By 2004, 3 more prototypes were built, for a total of 6, and a second stage of test flights were concluded on December 15, 2004. In one of the test flights the future commander-in-chief of the People's Liberation Army Ground Force Air Force (PLAGAF), Song Xiangsheng (宋湘生), was on board the prototype. A third stage of intensive test flights followed, taking place during both day and night. By January 2006 weaponry and sensor tests, including firing of live ammunition, had taken place. The helicopter was introduced to the general public in December 2010 and subsequently entered service with the People's Liberation Army. In 1972, the Italian Army began forming a requirement for a light observation and anti-tank helicopter. Agusta had initially studied the development of a combat-orientated derivative of their existing A109 helicopter, however they decided to proceed with the development of a more ambitious helicopter design. In 1978, Agusta formally began the design process on what would become the Agusta A129 Mangusta. On 11 September 1983, the first of five A129 prototypes made the type's maiden flight; the fifth prototype would first fly in March 1986. The Italian Army placed an order for a total of 60 A129s. In 1984, the French and West German governments issued a requirement for an advanced multirole battlefield helicopter. A joint venture consisting of Aérospatiale and MBB was subsequently chosen as the preferred supplier. According to statements by the French Defence Minister André Giraud in April 1986, the collaborative effort had become more expensive than an individual national programme and was forecast to take longer to complete as well. In July 1986, a government report into the project alleged that the development had become distanced from the requirements and preferences of the military customers the Tiger was being developed for. Both France and Germany reorganised the programme. Thomson-CSF also took over the majority of the Tiger's electronic development work, such as the visual systems and sensors. Despite the early development problems and the political uncertainty between 1984 and 1986, the program was formally relaunched in November 1987; it was at this point that a greater emphasis on the attack helicopter's anti-tank capabilities came about. Much of the project's organisational framework was rapidly redeveloped between 1987 and 1989; such as the installation of a Franco-German Helicopter Office to act as a program executive agency in May 1989. Due to the end of the Cold War and subsequent defence budgets decreases in the 1990s, financial pressures led to further questions regarding the necessity for the entire program. In 1992, Aérospatiale and MBB, among other companies, merged to form the Eurocopter Group; this led to considerable consolidation of the aerospace industry and the Tiger project itself. 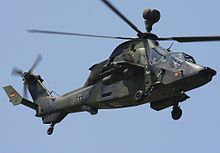 A major agreement was struck in December 1996 between France and Germany that cemented the Tiger's prospects and committed the development of supporting elements, such as a series of new generation missile designs for use by the new combat helicopter. On 18 June 1999, both Germany and France publicly placed orders for an initial batch of 160 Tiger helicopters, 80 for each nation, valued at €3.3 billion. On 22 March 2002, the first production Tiger was rolled out in a large ceremony held at Eurocopter's Donauworth factory; although production models began initial acceptance trials in 2003, the first official delivery to the French Army took place on 18 March 2005; the first official Tiger delivery to the Germany followed on 6 April 2005. Germany reduced its order to 57 in March 2013. In 2008 OCCAR estimated the project cost at €7,300,000,000. France's FY2012 budget put their share of the project at €6.3bn (~US$8.5bn), implying a programme cost of €14.5bn (~US$19.5bn) to the three main partners. At FY2012 prices, their 40 HAP cost €27m/unit (~US$36m) and their 40 HAD €35.6m/unit (~US$48m), including development costs the French Tigers cost €78.8m (~US$106m) each. The Rooivalk project began in early 1984 under the auspices of the Atlas Aircraft Corporation, a predecessor of Denel Aviation. Faced with the increasingly conventional nature of the South African Border War, the South African Defence Force recognised the need for a dedicated attack helicopter and accordingly set along the process of developing a suitable aircraft. The Atlas XH-1 Alpha was the first prototype to emerge from the program. It was developed from an Aérospatiale Alouette III airframe, retaining that helicopter's engine and dynamic components, but replacing the original cockpit with a stepped tandem one, adding a 20 mm cannon on the nose and converting the undercarriage to tail-dragger configuration. The XH-1 first flew on 3 February 1985. The results were ultimately good enough to convince Atlas and the SAAF that the concept was feasible, opening the door for the development of the Rooivalk. During the Rooivalk's development, it was decided to base the aircraft on the dynamic components of the Aérospatiale Super Puma, a larger and more powerful helicopter. These components were already used on the Atlas Oryx, a local upgrade and modification of the Aérospatiale Puma. Unfortunately, the development of the Rooivalk continued until after the conclusion of the South African Border War and defence budgets were slashed due to parliamentary changes to the requirements of the national air force. This resulted in an extensive development and production period beginning in 1990 until 2007, during which 12 aircraft were produced for use by the South African Air Force. These aircraft were subsequently upgraded to the Block 1F standard by 2011. The upgrade involves improved targeting systems and other avionics which enable the helicopter to use guided missiles for the first time. The Mokopa ATGM was qualified as part of the upgrade process. Gearbox components were improved and cooling problems with the F2 20 mm cannon were also addressed. On 1 April 2011, the South African Air Force received the first five of eleven (one of the twelve aircraft originally delivered to the SAAF was written off after an accident) Block 1F upgraded Rooivalk. The ninth and tenth Rooivalk attack helicopters were delivered in September 2012 following their upgrade to the Block 1F initial operating standard. The eleventh and final Rooivalk was delivered on 13 March 2013. The Indian Army deploys the Mil Mi-35 (export variant of Mi-24V) and HAL Rudra as of 2014. During the Kargil War in 1999, the Indian Air Force and the Indian Army found that there was a need for helicopters that can operate at such high-altitude conditions with ease. Limitations from operating with high payloads and restricted maneuverability of Mil Mi-35 led India to develop the HAL Light Combat Helicopter and HAL Rudra for multi-role high-altitude combat operations. These helicopters will be used by the Indian Air Force and the Indian Army's Aviation Corps. Although usually ignored by observers, the Iran–Iraq War of the 1980s saw "the most intensive use of the helicopters" in a conventional war ever, as well as the only confirmed helicopter dogfights in history; in particular, AH-1J SeaCobras of Iranian Army Aviation engaging with Mi-24 Hind and Mi-8 Hip helicopters of the Iraqi Army Air Corps. The 1990s could be seen as the coming-of-age for the U.S. attack helicopter. The AH-64 Apache was used extensively during Operation Desert Storm with great success. Apaches fired the first shots of the latter war, destroying Iraqi early warning radar and SAM sites with their Hellfire missiles. They were later used successfully in both of their operational roles, to direct attack against enemy armor and as aerial artillery in support of ground troops. Hellfire missile and cannon attacks by Apache helicopters destroyed many enemy tanks and armored cars. The "deep attack" role of independently operating attack helicopters came into question after a failed mission, during the 2003 Gulf War attack on the Karbala Gap. A second mission in the same area, four days later, but coordinated with artillery and fixed-wing aircraft, was far more successful with minimal losses. In 2011, France and Britain sent Eurocopter Tiger and AgustaWestland Apache attack helicopters to Libya. The primary objective of the 2011 military intervention was to protect civilians in accordance with UN Security Council Resolution 1973. Within days of the Apaches deployment, it had completed a variety of tasks such as destroying tanks, checkpoints held by pro-Gaddafi forces and vehicles carrying ammunitions loyal to Muammar Gaddafi. The attack helicopters were reported to be far more effective than the fighter jets which had previously been assigned these tasks. 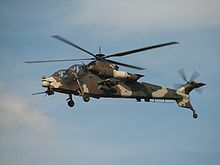 In 2013, the South African National Defence Force announced that it would deploy Denel Rooivalk attack helicopters to the Democratic Republic of the Congo to support the United Nations Organization Stabilization Mission in the Democratic Republic of the Congo. This was the first combat deployment for the helicopter. Three helicopters from 16 Squadron SAAF were deployed to the region and since November 2013 it was involved in heavy fighting alongside the United Nations Force Intervention Brigade, against rebels operating in North Kivu, in particular the M23 militia, which consisted of hardened former government troops equipped with relatively heavy weaponry such as main battle tanks and anti-aircraft weaponry. During its first ever combat mission it proved to be instrumental in routing the rebels from their hilltop strongholds during an offensive by the United Nations Force Intervention Brigade and the Military of the Democratic Republic of the Congo. ^ Noggle, Anne; White, Christine (2001). A Dance with Death: Soviet Airwomen in World War II. Texas A&M University Press. pp. 20–21. ISBN 1-58544-177-5. ^ Francis, Devon E., Mr. Piper and His Cubs, Iowa State University Press, ISBN 0-8138-1250-X, 9780813812502 (1973), p. 117. ^ Mazarella, Mark N. "Adequacy of U.S. Army Attack Helicopter Doctrine to Support the Scope of Attack Helicopter Operations in a Multi-Polar World" Archived April 9, 2008, at the Wayback Machine. Fort Leavenworth, Kansas: U.S. Army Command and General Staff College, 1994. Accessed on 12 December 2007. ^ a b c d "An Abridged History of the Army Attack Helicopter Program". Office of the Assistant Vice Chief of Staff of the Army. Department of the Army. 1973. Archived from the original on 2006-10-04. ^ Glantz, David M. "The Triumph of Maneuver War - Soviet Operational Art Since 1936". US Army Center of Military History. Archived from the original on September 21, 2012. Retrieved July 24, 2012. ^ Culhane, Kevin V. (1977). "Student research report: The Soviet attack helicopter" (PDF). DTIC. Retrieved 1 July 2011. ^ Yefim Gordon & Dmitry Komissarov (2001). Mil Mi-24, Attack Helicopter. Airlife. ^ a b Frawley, Gerald. "Mil Mi-28". The International Directory of Military Aircraft, 2002/2003, p. 128. Aerospace Publications, 2002. ISBN 1-875671-55-2. ^ "Jane's Helicopter Markets & Systems". Archived from the original on 2006-12-28. ^ "About the FlightGlobal Group - Blogs Announcement - flightglobal.com". Flightglobal.com. ^ a b Donald, David, ed. "Agusta A 129 Mangusta". The Complete Encyclopedia of World Aircraft. Barnes & Noble Books, 1997. ISBN 0-7607-0592-5. ^ Frawley, Gerald. "AgustaWestland A129 Mangusta". The International Directory of Military Aircraft, 2002/2003. Aerospace Publications, 2002. ISBN 1-875671-55-2. ^ a b c Krotz 2001, p. 130. ^ Krotz 2011, p. 131. ^ Krotz 2011, p. 133. ^ Krotz 2011, pp. 133-135. ^ Krotz 2011, p. 147. ^ Krotz 2011, pp. 132, 149. ^ Krotz 2011, p. 154. ^ "Germany finalises cuts to NH90, Tiger helicopter orders". Flightglobal.com, 18 March 2013. ^ Tran, Pierre. "Eurocopter: Despite Slow Economy, Tiger Helo Deliveries On Track." Defense News, 29 Jan 2013. ^ a b "Projet de loi de finances pour 2013 : Défense : équipement des forces" (in French). Senate of France. 22 November 2012. Retrieved 2013-11-07. ^ Dely, Frans (2004). Soaring with Eagles (no page numbers, section on 16 Sqdn). Avpix Publishing Pty Ltd. ISBN 0-620-32806-1. ^ Campbell, Keith (2007-06-08). "What went wrong with the Rooivalk?". Engineering News. ^ "Denel's Mokopa PGM ready for market". DefenceWeb. 2011-01-26. Retrieved 2013-03-15. ^ "SAAF ceremonially receives Rooivalk". DefenceWeb. 2011-04-01. Retrieved 2013-03-15. ^ "First five Rooivalk now in service". DefenceWeb. 2011-04-04. Retrieved 2013-03-15. ^ David Donald (2012-09-28). "Gripen, Rooivalk Deliveries Bring SAAF up to Strength | Aviation International News". Ainonline.com. Retrieved 2013-03-15. ^ "Final Rooivalk Handover Cements Relationship Between Denel and SAAF". defenceweb.co.za. Retrieved 2013-03-15. ^ "The Tribune, Chandigarh, India - Main News". www.tribuneindia.com. ^ "News18.com: CNN-News18 Breaking News India, Latest News, Current News Headlines". News18. ^ Williams, Anthony G.; Gustin, Emmanuel (2004). Flying Guns of the Modern Era. Marlborough: Crowood Press. pp. 171-172. ISBN 9781861266552. ^ Scarborough, Ryan (April 2003). "Apache operation a lesson in defeat; Army choppers hit without air cover". Washington Times. ^ O'Rourke, Ryan (June 4, 2003). "Iraq War: Defense Program Implications for Congress" (PDF). Congressional Research Service: CRS–36. Archived from the original (PDF) on 2008-02-27. Retrieved 2007-12-12. ^ "Exclusive: Rooivalk is going to DRC". DefenceWeb. 2013-10-11. Archived from the original on 2013-10-12. Retrieved 2013-10-13. ^ Mohlaoli, Tumaole. ""It was clear that the rebels didn't expect us" -- SANDF pilot". eNCA report. eNCA. Retrieved 14 May 2014. ^ Olivier, Darren (2013-11-05). "Rooivalk attack helicopters perform well in first combat action against M23". African Defence Review. Retrieved 2013-11-05. ^ a b Apache AH Mk 1 Archived 2009-06-19 at the Wayback Machine, AgustaWestland. Riley, David, French Helicopter Operations in Algeria Marine Corps Gazette, February 1958, pp. 21–26.